The Boston Celtics got real feisty tonight in Game 4 of the Eastern Conference Finals and went on a decent little run at the start of the game. Despite not having Isaiah Thomas for a second straight game, Boston defied its true home (the trash can) and won the first quarter by 10 points. They saddled LeBron James with four fouls before halftime and got their lead up to 16 points. Were the Celtics suddenly stronger when backed into a corner and forced to play Jonas Jerebko 21 minutes? As it turns out, nah, of course not. LeBron did his thing tonight and racked up 34 points, six assists, and five rebounds, but the real star of the evening was Kyrie Irving. The Cavs point guard helped stave off the Celtics in the second quarter and steady a worryingly waterlogged ship as LeBron sat with his fouls. 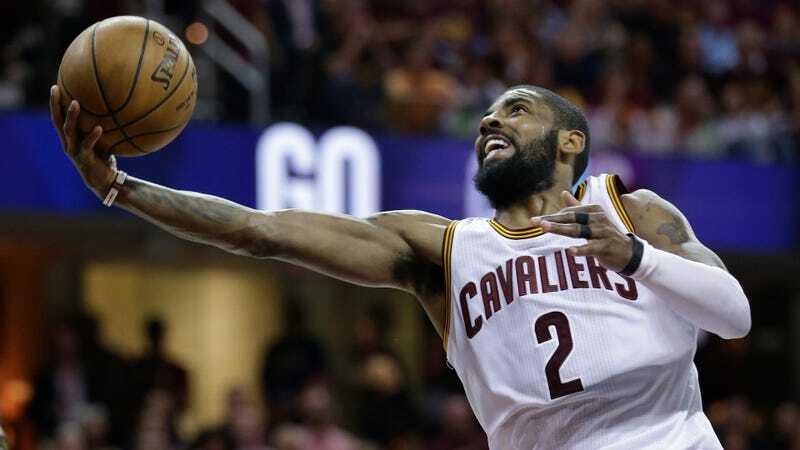 Irving’s handle is probably better than anyone else in the NBA and even when his shot isn’t going, he can penetrate through the first layer of the defense and get something going for the Cavs. When he can keep defenses honest, good luck ever staying in front of him. The Celtics’ lead always felt flimsy, and Irving took a sledgehammer to it in the third quarter, nearly outscoring Boston by himself and formally putting an end to their chances with a magnificent 21-point frame. As the Celtics closed out on him harder, his layup artistry only got better. His nine made field goals in one quarter set a new Cavs playoff record. He even closed things out with a bomb. He only made a single shot in the fourth quarter, but it was easily the bucket of the game. If anyone has seen Jae Crowder, please let him know where the team bus is. The Cavs are now up 3-1, the most dangerous lead in sports. Who knows, maybe they’ll go belly-up and lose to Terry Rozier, a man who eats spaghetti and sugar sandwiches, but nobody in the East is touching them if Kyrie is balling like this.